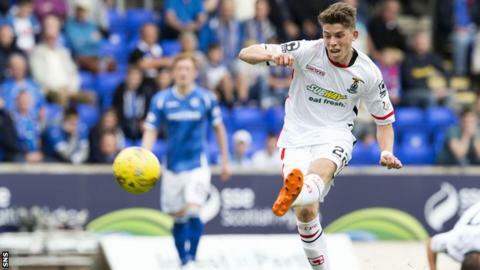 Inverness boss John Hughes says Ryan Christie has the makings of an international player after the midfielder's display at St Johnstone. The attacking midfielder struck the opening goal in the 1-1 draw at McDiarmid Park and came close on several other occasions. "Ryan Christie will play for Scotland," Hughes told BBC Radio Scotland. "He's quite happy at Inverness and he's still learning his trade. This is a great grounding for Ryan Christie." Though pleased with his side's performance, Hughes was frustrated at only taking a point in Perth after Graham Cummins's late header secured a draw for Saints. "I felt we were good enough to score another couple of goals," Hughes said. "We need to be more ruthless, but that's football. No complaints about their effort and commitment. "We can build on that now, that's a platform. Some of them have to get up to speed in terms of fitness." Saints manager Tommy Wright was pleased to get a point on the board after a poor first-half display from his side. "The first half wasn't particularly good for us," he said. "We created one or two opportunities but we were too slow in our passing. "Second half was much better. We moved it a lot quicker, created quite a few opportunities and [we're] obviously pleased to show character to keep right into the game to the 90th minute and get a great goal. "I think it was a deserved equaliser. We created enough in the second half to get something out the game. "At the start of every season, you want that first win and if you can't get that win, it's important to get a point. "One-nil down with only injury time to go and hopefully it'll be a good platform for us to go and kick on in the season. It's a good point against a good side."